Charles C. Stevenson was born in Ontario County, New York on February 20, 1826. His education was limited and attained in the public schools of Canada and Michigan. In 1859, he joined a group that was headed west to Pike’s Peak, but decided to continue on to Nevada where he was one of the first to arrive on the Comstock. When he arrived in Ophir (later Virginia City), there was only a tent and a brushwood saloon. Stevenson found moderate success in the silver mines, and also worked as a farmer and a miller. He also became part-owner of the Cooper and Stevenson quartz mill and later in life struck gold. He first entered politics as a member of the Nevada State Senate, a position he won election to in 1866, 1868, and 1872. He was a delegate to the 1872 and 1884 Republican National Conventions, and served as chairman of the 1885 Nevada Silver Convention. He also served as a member of the University of Nevada Board of Regents from 1875 to 1887, and was a state commissioner representing Nevada at the 1876 Philadelphia Centennial Exposition. The early success of the University of Nevada is often credited to Stevenson’s efforts as Governor and as a Regent. 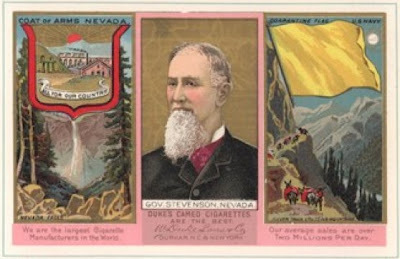 Stevenson next secured the Republican gubernatorial nomination, and was elected Nevada’s fifth governor by a popular vote in 1886. During his tenure, the Stewart Indian School was created, the University of Nevada was restructured, railroad construction was advanced, and programs were established that supported the livestock and farming industries. Stevenson is credited with introducing top-graded Jersey cattle to Nevada at his own expense. During his tenure as Governor his brother, Edward Stevenson, served as the Governor of the Idaho Territory. Edward died from a opium overdose while being treated for back pain. On September 21, 1890 Governor Charles C. Stevenson died of typhoid fever at his home in Carson City, becoming the first Nevada governor to die in office. His sons from a first marriage, Edward and Lou, challenged Stevenson’s will. Both had been bequeathed $1,000 with and an additional $500 for their children. The judge ruled against them and in favor of their stepmother who had been named executor of the estate. She died two years later and is also buried at Mountain View. The succession of the new Governor after his death was a bit unusual. Lieutenant Governor H.C. Davis died about a year before Stevenson. Frank Bell, the warden of the state penitentiary, was appointed as acting Lieutenant Governor. Upon Stevenson’s death he assumed the office of Governor.